From Macklowe Gallery, Madison Avenue, New York. 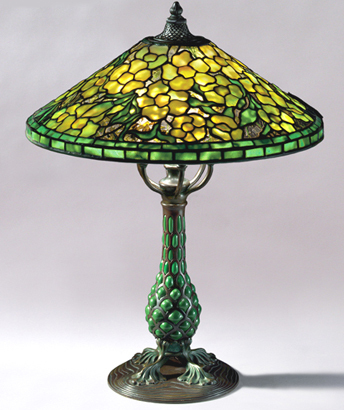 Tiffany Studios "Alamander" table lamp, decorated with yellow flowers on a clear ground and a green band of trim sitting on a patinated bronze base with green blown glass. Shade signed, "Tiffany Studios New York 1479-4". Base signed, "338 Tiffany Studios New York". Circa 1910. Dimensions: 24" high x 18½" diameter of shade. ©2003, Macklowe Gallery, all rights reserved.